Hey everyone! Hope you're having a lovely Sunday. Today I thought that I would do another iPhone app post on all the apps I use however I'm going to focus on what my favourite iPhone apps are for blogging. I put a huge chunk of my life into my blog at the moment as I'm still waiting for my job to start with British Airways so I thought why not show you the apps I use for my blog whilst I'm on the go and not on my laptop. Keep reading to find out more. Echofone is basically a twitter app and I prefer using this over the actual twitter app as I just find it so much better and easier to use. Twitter isn't complicated at all to use but I just find echofone fool proof. You don't get every single interaction in the notification section either and I just prefer the layout and look of the app over twitter. If you follow me then you will know I'm always on here. I love posting my links to posts on here and just talking to everyone else on it. Definitely my most used app. I absolutely love instagram. I'm constantly posting photos on there whether it's a selfie, photos of my friends or family, outfits, or even food you can find it all on there. I also think it's amazing to have in terms of following other bloggers and finding new bloggers to follow. I love posting photos from my blog posts on there too and using hash-tags for beauty bloggers or lifestyle bloggers as I find it's amazing for getting traffic to your blog. Definitely an important one to have on my phone. I love Pinterest for posting photos from my posts on there but also to just find different inspiration whether it's beauty or fashion it's all on there. I'm a little bit addicted to it not going to lie. In the last month alone I think I've pinned over 1500 images. Whoops! But I absolutely love it and you can find anything on there. I love going on there and looking for photos for blogposts where I haven't taken photos myself just to illustrate the post a little bit. It's just so good to have and recently a lot of my traffic has been coming from there which I am extremely happy about! The one thing every blogger has out there no matter which blog you have as this is where people will go to follow you. I absolutely love this app as it's super easy to read and follow different blogs in different categories too. I also love the analytics section as you can see where your blog is ranked. It's just an amazing app to have even if it does have a lot of glitches occasionally. This is basically like pinterest except I don't really use it as much but it's amazing to have if you're looking for inspirational pictures or photos to illustrate a post. I'd definitely recommend getting this as it's an amazing back up for when pinterest doesn't pull through. I haven't used this app in a while however I think this is amazing for doing different collages of photos if you do a post about all the posts you've written that month. You can just put a photo from each post into here and upload it to blogger. So simple and affective. I also love putting collages of me and my friends in here too to use as wallpaper. This is basically the blogspot app which I don't really use as often as I should however if I have an idea for a blog post I'll write down the notes in this app and save them so when I log into my laptop I can open it up and finish where I left off. Definitely a useful one to have. If you're a list maker then you need this app in your life. I won't lie here I've never really been into lists however I do make lists for blog posts and tick them off as I go. However you can do so much on here, I'd highly recommend it. It's literally heaven in a phone for list makers. The best app for editing photos on your iPhone. Whether you want to brighten an app or add different filters or just spruce up a photo however you wish then this app will do just the trick. I mainly use this for brightening up my blog photos before posting them on instagram. A perfect app if you do outfit idea posts or wishlists as you can just create a little collage and then post it onto blogger. I tend to use this on the computer more than on my iPhone but it's still a really good app to use if you're on the go and don't have time to do it on a computer. 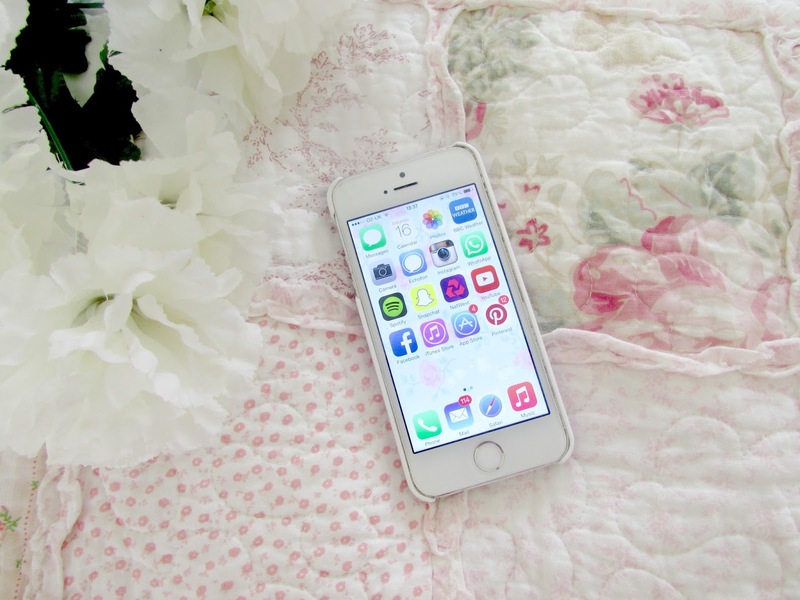 So there are my favourite iPhone apps for blogging. I know this is based around my phone as I have an iPhone but if you don't have an iPhone maybe there are similar apps available for your phones too! Most of these are free too so you don't need to worry about forking out loads for them. Free and extremely brilliant apps! If there are any other apps you can think of that are good for blogging then be sure to leave them in the description below as I'm always on the look out for more apps. What iPhone apps do you use for blogging? Love posts like this. Downloading Wunderlist as I type!